Claude Monet (1840–1926), San Giorgio Maggiore at Dusk (1908), oil on canvas, 65.2 × 92.4 cm, National Museum, Cardiff, Wales. Wikimedia Commons. Not another book about Monet and the French Impressionists? It would be easy to see this as a ploy to sell plenty of copies of the book, and pack the exhibition in Aarhus, on the marketability of their subject. As Erlend G Høyersten writes in the second chapter, reproductions of Monet’s paintings are to be found everywhere, even in dentists’ waiting rooms. They are so familiar that they are now overexposed, devalued, lost in translation. Høyersten, with curator and editor Suzanne Greub, therefore set out to help us revisit the paintings of Monet and his contemporaries, in a fresh light. This includes their context, which the book and exhibition aim to establish. The entire publication is bilingual, in (almost faultless) English and Danish, their texts set side-by-side in two columns. Its introductory chapter, by Beisiegel and Greub, is probably the most complete and balanced short summary of the French Impressionists available. Beautifully illustrated, it sets a pattern of mixing some very familiar landmark paintings with worthy but much less-known works, together with photographs. In the space of just over twenty pages (each with both English and Danish versions, of course), it covers all the most important ground well. Even if you can recite whole chapters by Rewald and House, this is an excellent orientation. This disarmingly modest honesty leads on to the first of the more academic essays, looking at the Impressionists as a group and as individuals through portraits, by Laurence Madeline. This considers the painted evidence surrounding the myth of the formation of the Impressionists as a ‘limited company’ and cohesive group in 1873. He shows us the familiar, Fantin-Latour’s A Studio in Batignolles (1870) and Bazille & Manet’s Bazille’s Studio (1870), and a series of less well-known individual portraits. The evidence weighs against cohesion, and he concludes that their ‘limited company’ was a means to an end, rather than a group. Michael Clarke then considers the precursors and development of plein air painting. Although there is circumstantial evidence that some of the pioneering landscape painters did sketch in front of the motif using oils, he accepts that the first great practitioner for which there is solid evidence is Alexandre-François Desportes, during the years around 1700. 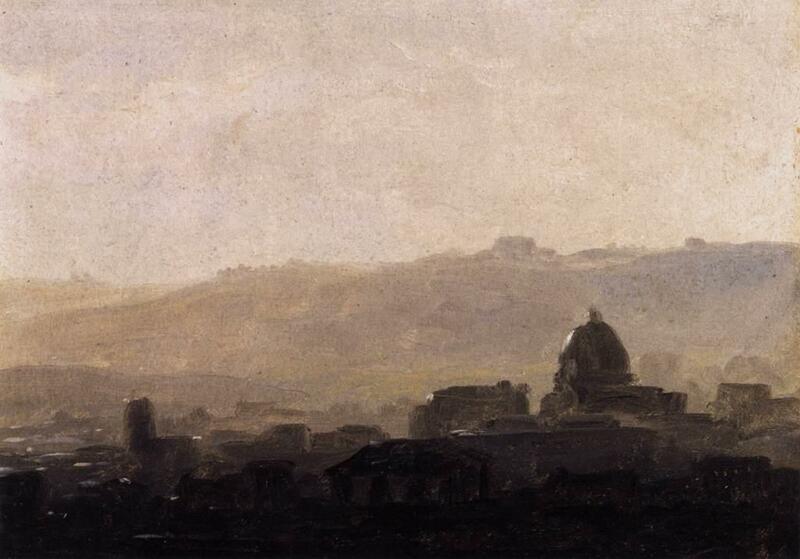 He then moves through the traditional references to plein air oil sketching by de Piles, Vernet, to Valenciennes, whose magnificent oil sketches were never intended for public viewing. He continues through Théodore Rousseau, Diaz de la Peña, Corot and Daubigny, to Boudin, and so to Monet. 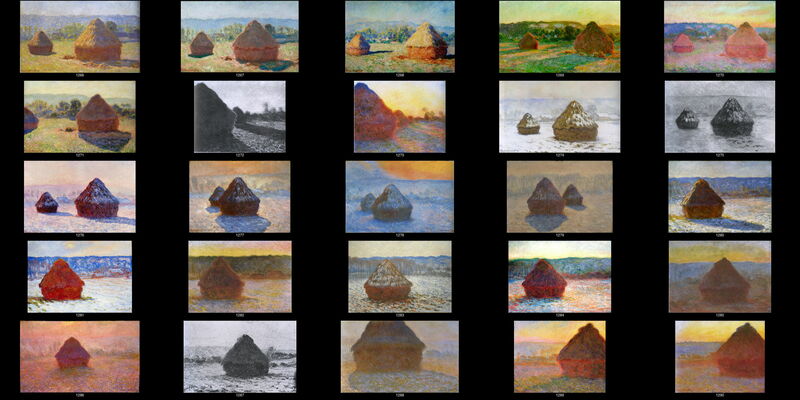 Clarke accepts that most works started plein air were undoubtedly completed in the studio, but concludes that Monet’s great plein air series, such as the Grainstacks (1890-1) pointed the way forward to serial art in the next century. 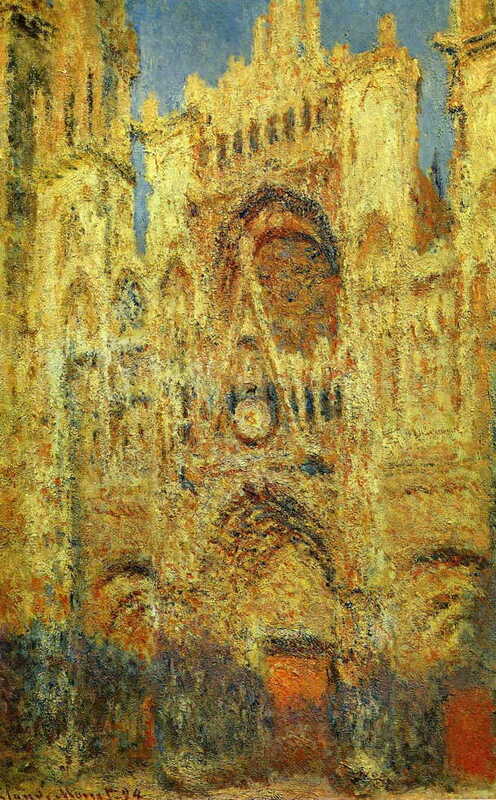 Sylvie Patin, of the Musée d’Orsay, next considers Monet in the role of the leader of the Impressionists. She presents her case in the form of an insightful account of the life and work of Claude Monet, illustrated by many of his best-known paintings. Most of these are in Musée d’Orsay, and it cannot be coincidence that none is included in the exhibition to which this book is the catalogue and guide: vital though they are to this account of Monet, they are also dangerously over-familiar. As with the other essays, this is superb, and the best short summary of its kind. 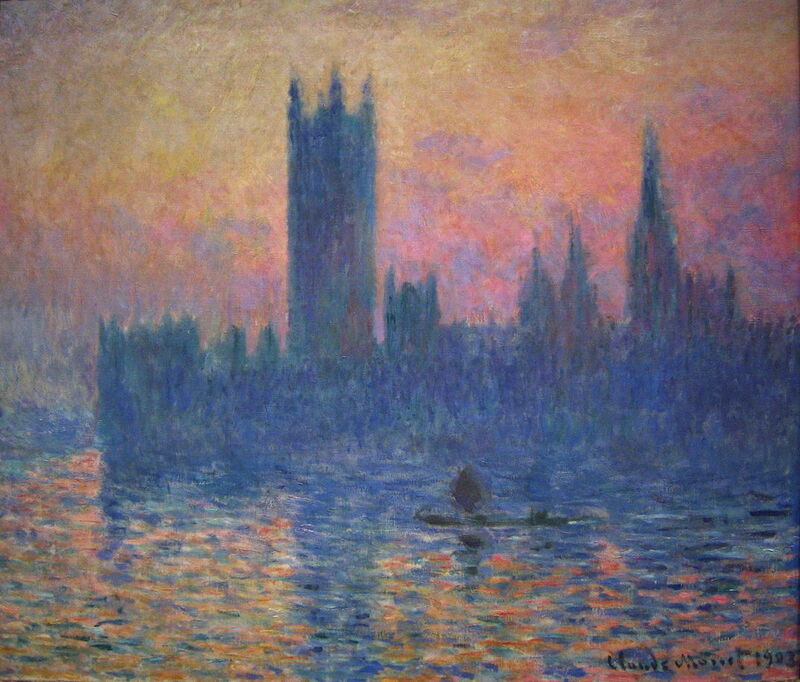 However it is largely about Monet in isolation, and does not consider the group dynamics, the crisis in Impressionism in the 1880s, Monet’s relationships with Degas and his friends, nor the business of Monet – no bad thing when our focus is on revisiting the art. With much of the context established, Karin Sagner writes about the great plein air painters and the seasons. Using less familiar works by Berthe Morisot, Sisley, Renoir, Monet, and Pissarro’s wonderful Four Seasons (1872-3), she examines seasonal themes, culminating in Monet’s series, and his late paintings at Giverny. These show a transition from reflections of life to visions beyond reality. She also recognises the importance of Jongkind, although sadly there is no example of his work shown here. Courbet’s seascapes and paintings of Étretat are examined too, and compared with Monet’s and Boudin’s. The penultimate essay, by James H Rubin, digs through the well-cultivated beds of Monet’s gardens. The only essay to focus almost exclusively on Monet’s paintings (except for two by Manet), it is rich with additional but relevant detail. This includes the fact that Chevreul, pioneer of the simultaneous contrast of colours when working as an industrial chemist at the Gobelins tapestry factory, had trained in natural history, worked at the Paris botanical gardens, and was an avid gardener. 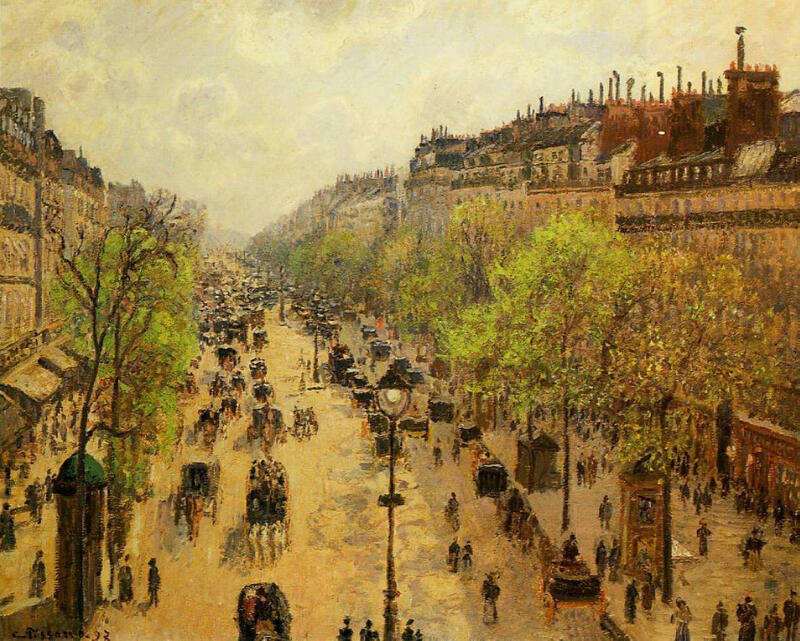 Finally, Clare A P Willsdon tackles the art of late Impressionism, after 1880. With the loss of any remaining cohesion, and Pissarro’s defection to Divisionism, it is easy to write the movement off completely. But rather than simply pursue individual re-invention, its artists also sought to relate to past traditions and examples. 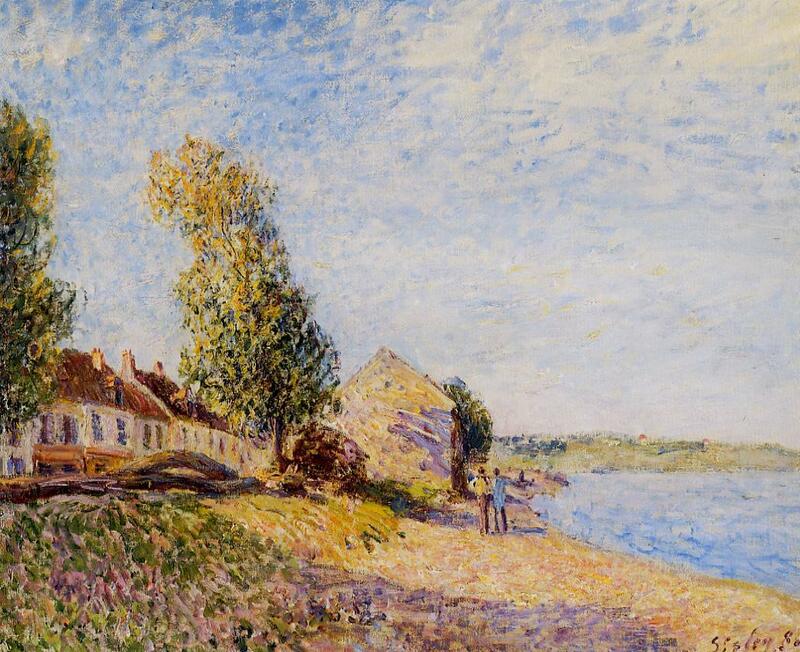 She refers to Monet, Courbet and Étretat, and Pissarro’s return to Impressionism in 1890. She also considers series paintings, reminding us of their earlier use by Turner, Jongkind, and Whistler. Returning to Étretat, she sees a quest for harmony, unity, and the visionary growing in Monet’s late paintings, citing contemporary criticism and comment, all culminating in his great water lily ensemble of 1904. As I have mentioned in passing above, this book is thoroughly illustrated with an unusually broad range of paintings from most of the French Impressionists, many of which will not be familiar to readers. End-matter is sparse to say the least. There is a list of the 49 exhibited works, given in order of their appearance in the book, and a good three-page bibliography, including artworks. Lamentably, and despite the superb and scholarly essays, there is no index at all. As there is no electronic version of this book available, this means that anyone wishing to search its content has to do so manually. I have written before that I consider this unacceptable, and no matter how common this fault might become, it hampers the reader, and does no justice to the authors who took the time and trouble to contribute to it. 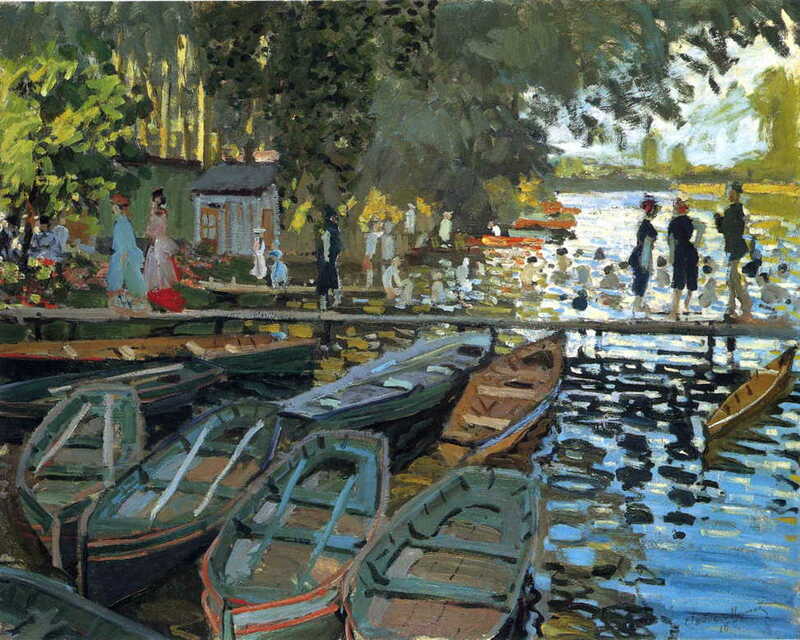 This is not just another book about the French Impressionists, or Monet. It stands out from a generally distinguished crowd by its fresh approach, by consistently excellent essays, and by achieving its commendable purpose. It does enable a proper re-evaluation of Monet and the French Impressionists, its only shortcoming being its lack of an index. If pressed, it could well be my first choice of books currently in print about Monet and the Impressionists, and is considerably lighter and much more accessible than other contenders. I strongly recommend this book for everyone with the slightest interest in painting, or art more generally. If the exhibition is half as good, it will be well worth the trip to Aarhus in the next month or two. This book is the catalogue and guide for the exhibition Monet – Lost in Translation, ARoS Aarhus Art Museum, Aarhus, Denmark, 9 October 2015 – 10 January 2016. Posted in General, Painting and tagged Boudin, Chevreul, Courbet, Impressionism, landscape, Monet, painting, Pissarro, plein air, Renoir, series, Sisley. Bookmark the permalink.